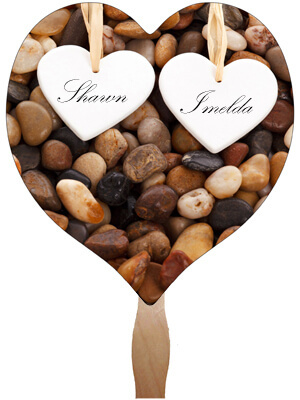 This wedding hand fan includes the stock design shown above. Cost includes 1 color print on the back. Custom text on front will cost extra. Imprint Area 7.89" Max Width X 8.2" Max Height. Please leave 1/4" bleed room. Sizes are approximate. Just like to take the opportunity in sharing the delight you product gave my daughter... Just a note: Not a big deal but would like for you to know the rear of the fan "printed lettering" on the back of the fan is not square or has a slight slant to message and the "fonts size" could of been 2 to 4 more in size. Thanks again for your services. Thank you for the awesome wedding hand-fans for our wedding this weekend. It was hot and they came in handy! We're very happy. Thank you for your help. We made several changes to our artwork proof for our wedding fans, and you were really patient with us. The fans were FANtastic and the print was excellent.